There’s something solid and reassuring about Tor, he’s only just turned 40 but his tweeds, beard, walking boots and wiggly walking stick give him the air of a retired University lecturer. 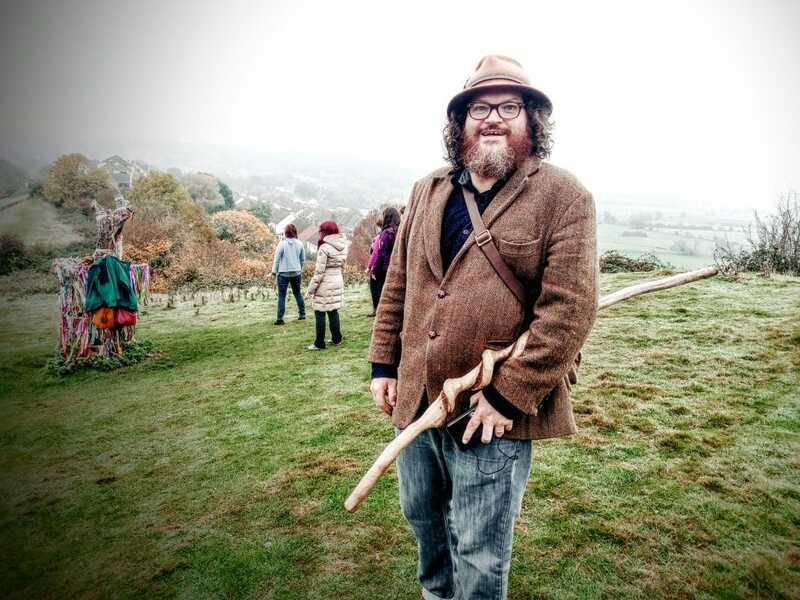 He’s been leading tours for five years, having started out casually taking friends and family around the sites of Glastonbury, and now he leads parties of between 1 and 40 people. He prefers groups of 8, as that’s how many his minibus accommodates, and much larger groups tend to lose focus. He reckons he guides about 170 people a year, visiting Glastonbury, Tintagel, Stonehenge, Avebury and other sacred sites in the South West. Tor with the Glastonbury Ley Line Map. When we got to the remains of the Holy Thorn on Wearyall Hill’s summit we encountered a Pilgrim Traffic Jam – a group of Spaniards doing Qi Gong. 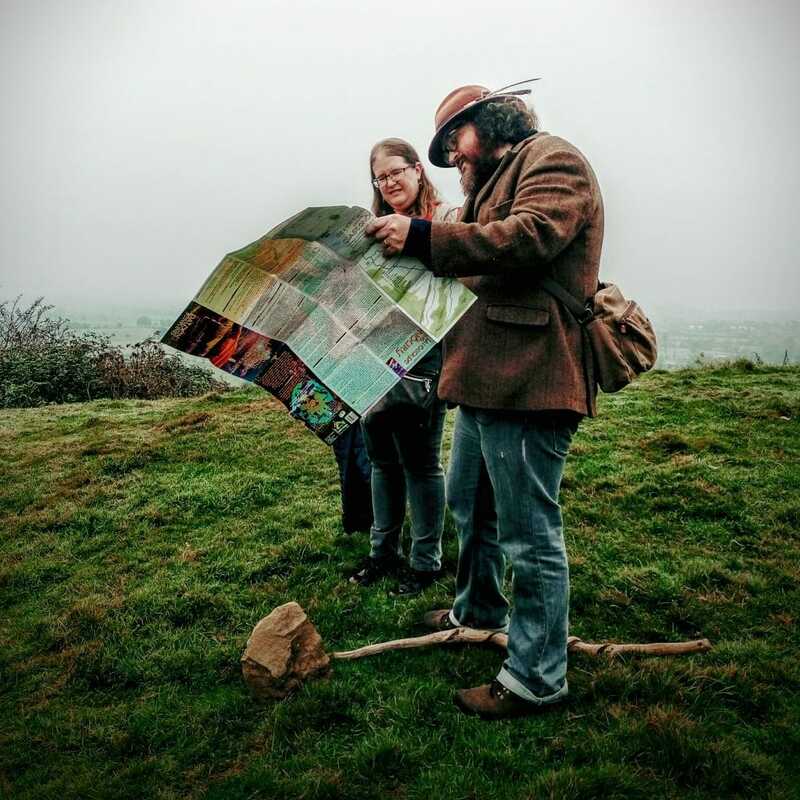 Tor started his spiel, I noticed he doesn’t use notes, just his stick to point out relevant features on the landscape, and a copy of Palden Jenkins’ Glastonbury Ley Line Map to show how everything joins up. 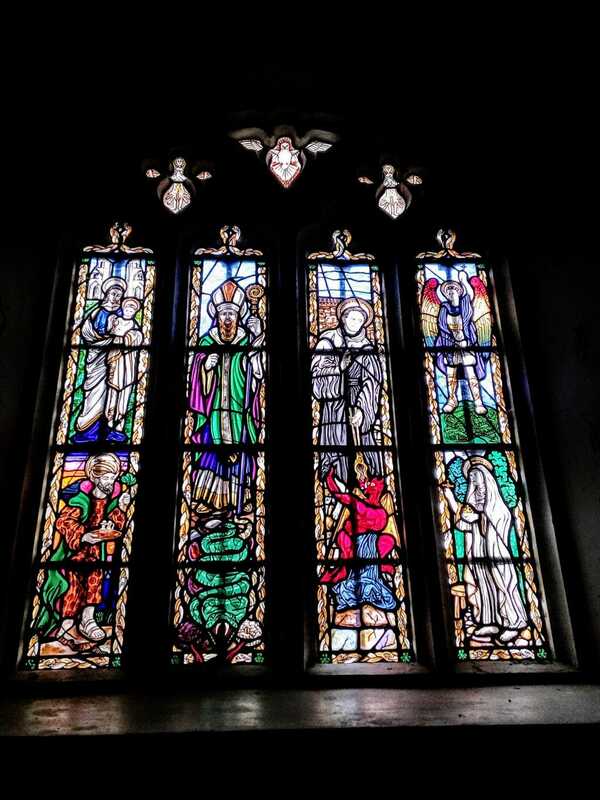 Tor began his talk with Joseph of Arimathea’s arrival in Glastonbury, and the construction of the round wattle and daub chapel that was England’s first church. He stated matter of factly that its dimensions mirrored Stonehenge, and that around it was placed 12 round huts, making it quite likely that the chapel and huts were constructed on top of the remains of a henge, sacred to the Pagans, sanctified by the first Christians. I’d never actually heard the henge theory before and I found myself wanting to ask for the evidence, the archaeological record, some peer reviewed papers perhaps, but then I remembered I was here to listen to a story that has had an enormous influence on the history and mystery of Britain, regardless of such concepts as ‘facts’ or ‘proof’. It felt appropriate to be listening to the Glastonbury story on such a misty day, Glastonbury’s past is hazy, vague, it’s difficult to be ‘sure’ about anything. the figures in the distance may be real, or spectres. King Arthur’s remains may lie in the Abbey, or the monks might have made it up to boost tourism, or there may not have been a King Arthur at all. Nobody really knows, they don’t call it the Dark Ages for nothing. Tor thinks of Glastonbury as a place of transformation rather than of healing, that is to say the healing comes about as a result of transformation. He believes the veil is thin here, so there is a greater connection to spirit, again the mists suggested we were peaking through the veil in the myth rich Vale of Avalon. Although Tor has an authoritative air he refutes any claim to be an historian, he’s happy to be defined as a tour guide, but to me he is a storyteller of the best sort. He told me he very rarely reads, as he is dyslexic, but he listens and remembers. He combines theories (many are his own), historical incidents and stories of the miraculous in a single lively and engaging narrative, which brings the long dead characters of Glastonbury’s past alive and together in this small Somerset market town. Listening to him I began to understand how these tales, of Joseph of Arimathea, Jesus, Mary Magdalene, Leylines, Arthur and Guinevere, Gwyn ap Nudd, a Zodiac marked out on the earth, Abbots, Kings and Saints have converged and connected in Glastonbury, making it a site of mystery and pilgrimage to people all around the world. Tor speaks of Glastonbury and its characters with great kindness, occasionally I got a hint of the things that displease him, but he clearly doesn’t dwell, or gossip. He doesn’t appear to have an agenda, he’s not out to convert or convince, simply to infect others with the magic of the town. 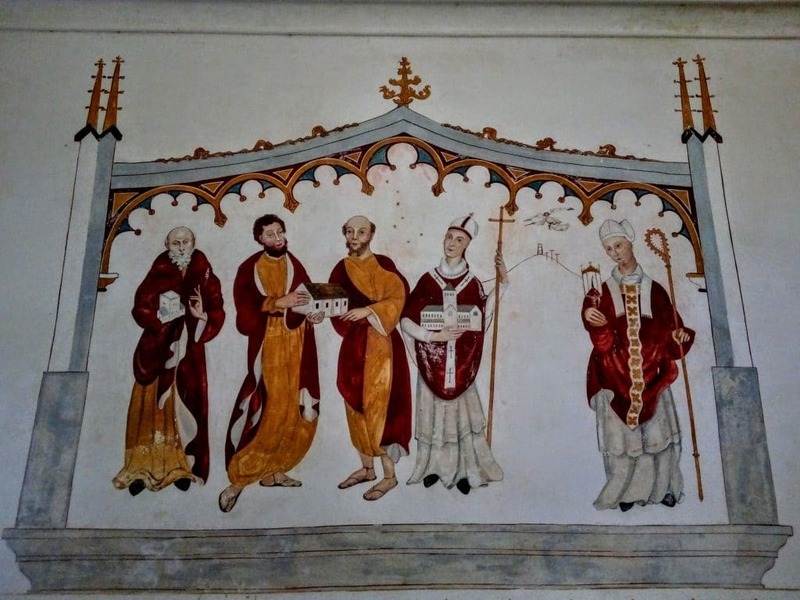 Tor took us into the town, pointing out the sites of the gateways to the Medieval town, each with their own slipper chapels where the monks would wash the feet of the visiting Pilgrims in the water from the Red Spring (Chalice Well), White Spring and, lesser known, Blue Well. The waters of these wells converge in the valley formed between Tor and Chalice Hills and then further down in the fish pond in the Abbey. 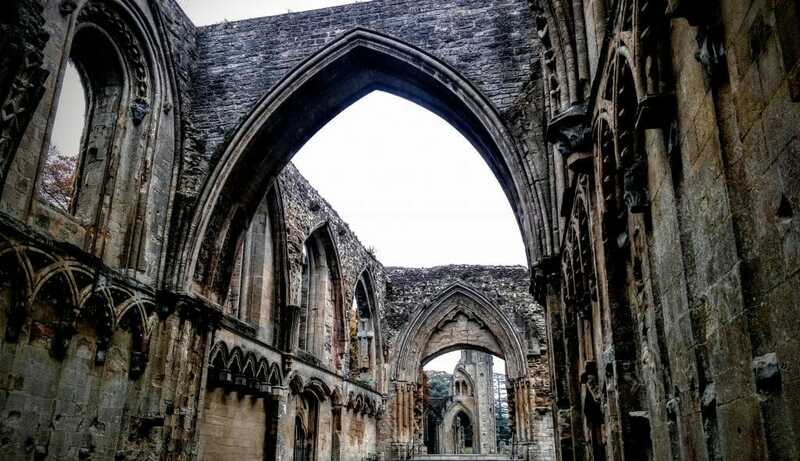 Glastonbury Abbey Gatehouse – click on the picture, zoom in, and you might be able to see the faint words. Tor pointed out numerous architectural features, carvings and symbols that I have walked past thousands of times and never really noticed. Like the statue of Abbot Whiting on the Catholic Church, Tower of the Tor in one hand and a noose around his neck. When we arrived at the Abbey Gatehouse, Tor pointed out the words above the door, I could clearly make out ‘liquors and spirits’, I had no idea that the building had started out as an inn. 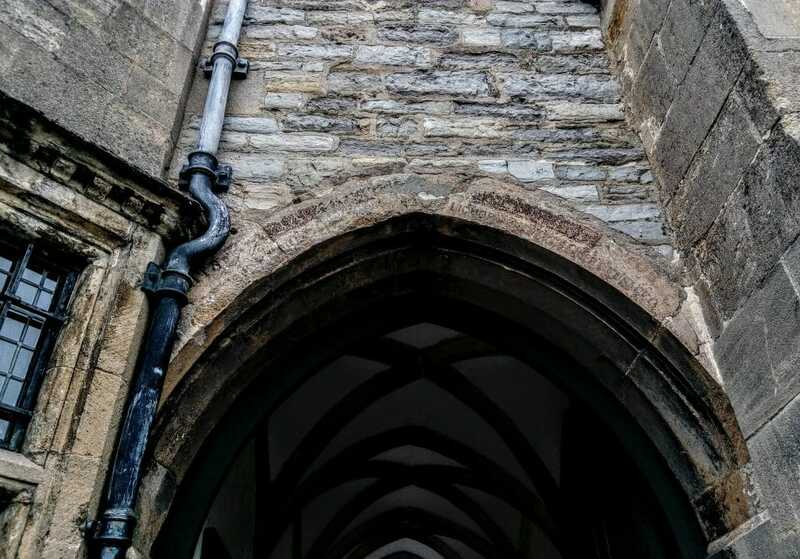 Originally the entrance to the Abbey was off Silver Street, but the Victorian owners who opened it as a tourist attraction, anticipating a royal visit, formed a much grander entrance off Magdalene Street that incorporated the old inn. Tor paid my entrance fee to get into the Abbey and we had a quick look round the museum. They’ve recently installed amazing large touch screens showing the architectural development of the Monastic buildings through the ages. We stood next to the 3D reconstruction of the Abbey in its heyday and talked about its destruction. I’d never heard it suggested that anyone besides Henry VIII was responsible for the Dissolution of the Abbeys, Tor suggested that the king was already too riddled with syphilis at the time, and puts the motivation squarely at the feet of Cromwell, who wanted the power of the Church in his hands and its coffers emptied to finance the recent war with France. Tor also talked about the subterranean tunnels that run underneath the town, a subject that has always fascinated me, being a bit of a troglodyte! 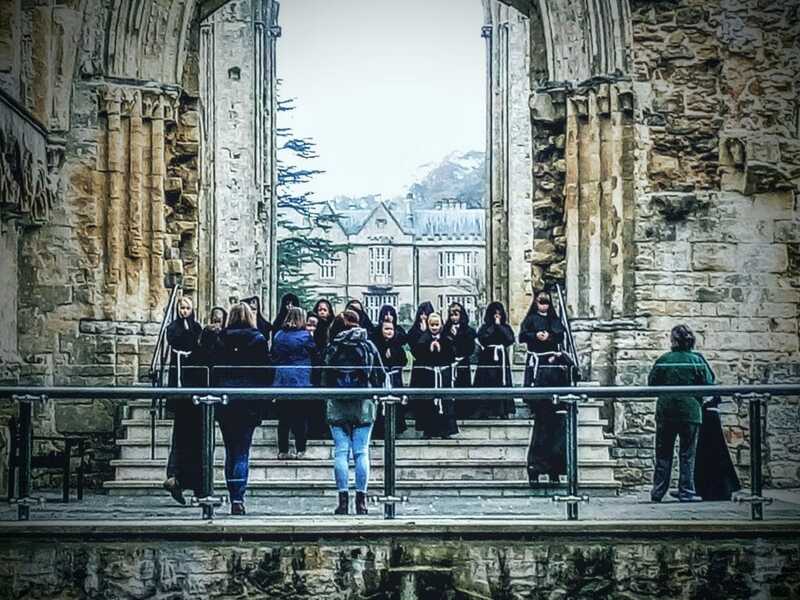 We headed to the Lady Chapel, where we had a Glastonbury moment as a procession of sombre, black clad monks filed past – a party of school children being shown round, followed by a teacher on an iPad. I was impressed at the ways in which the abbey is engaging visitors. Tor recounted the fascinating story of a man from the nearby village of Baltonsborough, by the name of James Austin, who was transported to Australia in 1802 for stealing honey and beehives. He made his fortune, returned to Glastonbury and in 1856 became the owner of the Abbey House and the Abbey itself, which was described at the time simply as ‘interesting ruins’ in the grounds of the house. I’ve since researched this story on the net, and even though it is in the comparatively recent past I find the accounts differ substantially as regards to the facts, and the dates. After a quick jaunt round the Abbey grounds, where I noticed they are expanding the Medieval Herb Garden, we headed for lunch. Tor took us to lunch at the Abbey Tea Rooms, I had never visited there before. Although I know it’s popular, not having any living grandmothers, I’d never really had a reason to check out it’s Old World Charm. 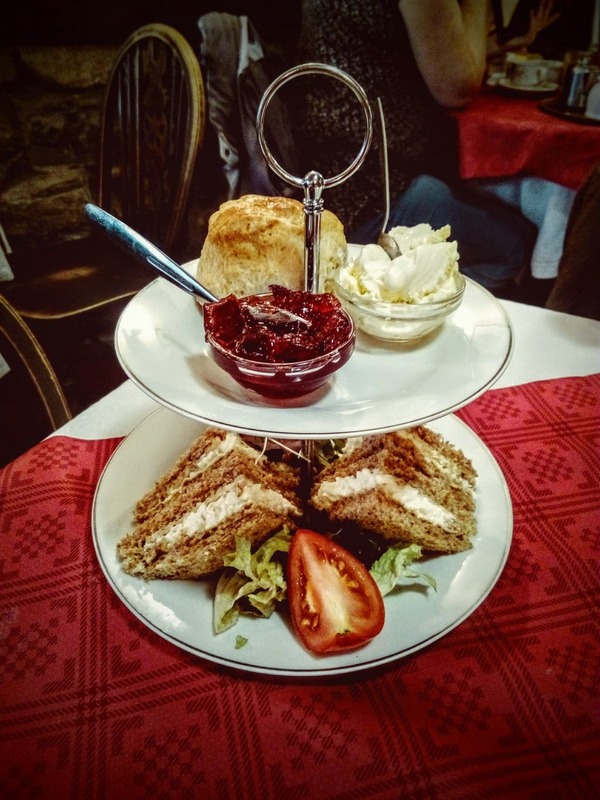 It really is like a trip back to the 1970’s, they have a great selection of Cream Teas and Savoury Teas and a lot of choices of traditional home cooking. I can understand why Americans love this place – it is the quintessential English Tea Rooms. 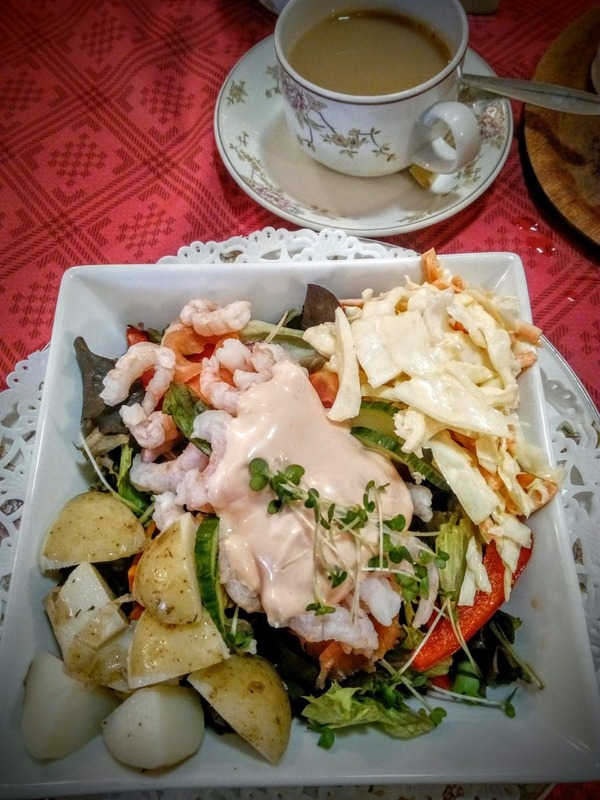 I went for the smoked salmon and prawn salad with homemade coleslaw and potato salad. It was exactly as I expected it would be. I was disappointed that the ‘homemade potato salad’ was plain new potatoes, with no dressing. Tor’s cream tea looked good, but I didn’t try it, as taking a bite of your host’s scone when he’s buying you lunch probably doesn’t go down well in Glastonbury’s most genteel establishment..
Next stop after lunch was St John’s Church in the High St. Tor sat us down to study his favourite stained glass window, and explained each character depicted, St George, St Michael and St Bride (St Bridget), and the significance of the symbols that accompanied each of them. He explained how St George thrusting his lance into the mouth of the dragon was about uniting heaven and earth, rather than simply a story of Christianity conquering Paganism. This was a constant theme of Tor’s talk, and numerous depictions of George and the Dragon that he pointed out in the town lended his theory some credibility. Tor believes that Arthur and Guinevere were buried in the Abbey, and that Henry II came looking for the bodies, only to be turned away by the Abbot, Tellingly, he says they were unearthed the year after Henry II died. He showed us the two heavy marble slabs which he believes covered their graves and are now either side of the altar in St John’s. This was the end of the Tour for me as I had work in the afternoon, and my head was buzzing with new information and food for thought. Tor and the American lady headed off up the Tor and the springs. I felt like a tourist for the day, which is no bad thing, as I find I’m not taking Glastonbury for granted as much, I’m looking around me more, noticing all those little things that make this such a unique and special town. 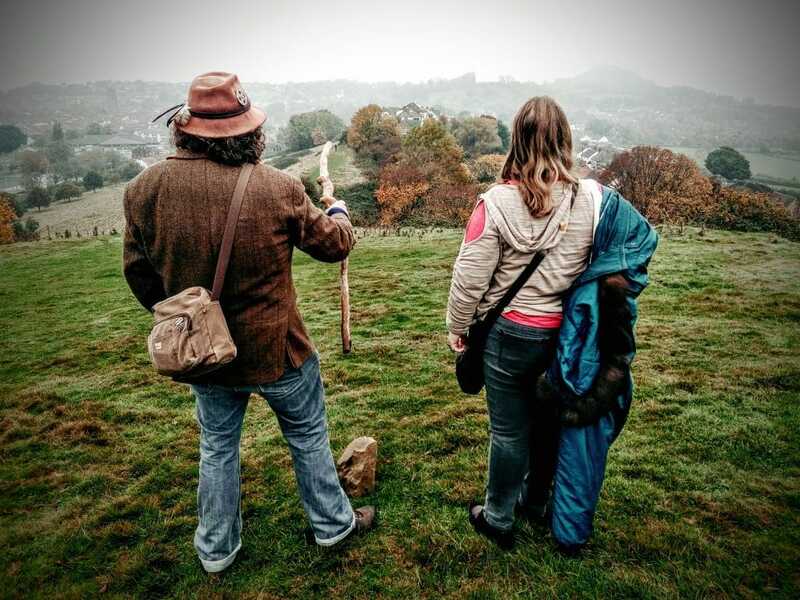 For that reason I’d recommend Tor’s Tour to locals as well as visitors – he’s planning on running a Glastonbury Tour for donations towards the end of the year, I’ll post details on my Normal for Glastonbury Facebook Page nearer the date. If you’d like to go on ‘Tor’s Tour of the Tour’ check out his website ‘Tor’s Tour of the Tor’ , he gets 5 stars on Trip Advisor which I’d say are very well deserved. Tor and his partner also offer accommodation at their B&B Moon in the Apple Tree. If you’d like a sneak preview of his Glastonbury Tor check out this video I made. If you find the idea of signing up to spend 6 days with a stranger as your guide daunting, I think you’ll find that 5 minutes with Tor are enough to reassure you that he is kind and respectful with a gentle humour that makes him the ideal guide. I spoke to Taylor who went on a tour with Tor and 7 other American ladies. They visited St Nectan’s Glen in Cornwall and Tor took his leave so they could have a private moment, returning after an hour to find them all stripped off and immersed in the waterfall, screaming and laughing. He called ‘YooHoo’ and told them it was time to move on and then left to give them space to dress. Taylor said his energy was respectful and soft and perfectly tuned to put them at their ease. Please share this post if you liked it, and feel free to like and comment. For more like this please Subscribe to my blog and check out my Normal for Glastonbury Facebook Page. All photos copyright Vicki Steward. If you don’t mind me asking, whereabouts was the original entrance to the abbey on Silver Street? Would be really interested to find out! 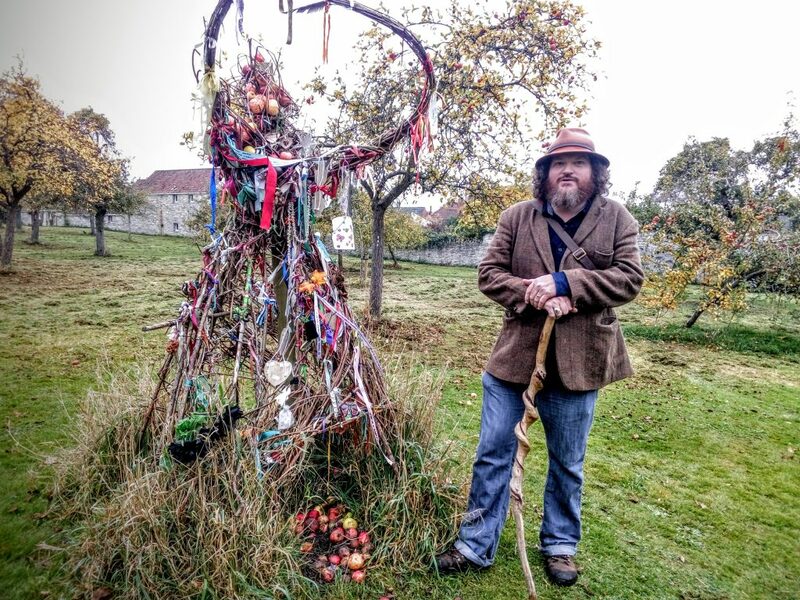 Would love to go on one of Tor’s tours of Glastonbury one day – sounds and looks amazing! Oh and love your blog – thank you! You might like to read the rest of the details on the British History Online site. Do go on one of Tor’s Tours, they are great, and he is one of the nicest people you could hope to meet. Thank you very much Vicki – that was fascinating to read! I’ve been imagining the flow of people down Hanover Square/Silver Street – changes the orientation somewhat!